Note: This assumes you have setup an event and have added at least one job. Click the desired event then click the Job Signup button. Click the Setup Events Jobs tab. Click an existing job name. Under Time Periods Setup either click the Add New button or click an existing Event Job Time Period. If this is a new Event Job Time Period, enter the starting and ending time period and number of positions required for the new job. 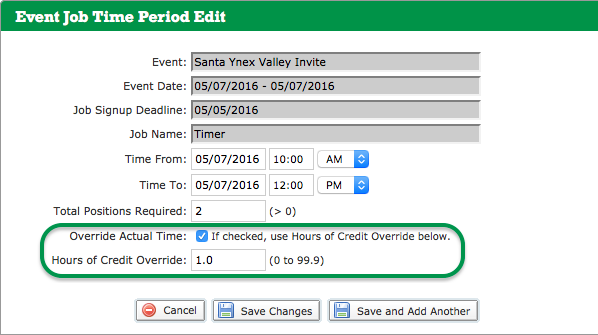 Check the Override Actual Time checkbox. Enter the number of points the job is worth in the Hours of Credit Override field. This value can be 0 to 99.9. Use decimals to denote a fraction. Note it only accepts tenths of a fraction (one digit). Click either Save and Add Another if you have more job slots to add, or Save Changes when finished. Will I see points on my reports if I change from Service Hours?